Every day you see Death Accidents in Indian local and main newspapers and in most cases truck driver fleeing after killing the innocents. The victims are the bike ones, small car ones and their families forever. There is height of these things now in Delhi-NCR. Rash Driving, Road Ragas and above all Truck Drivers Killings. I am totally shattered by the same truck-killing death in my known families just a day before, where 3 young boys died immediately after the truck crushed their car from behind. Truck driver fled from the scene immediately. And just see the event, One of them had his ‘marriage engagement’ today i.e. Monday, and they were driving with their own cousins brothers to eat some famous Indian food dish as ‘Pranthas’. It’s difficult to imagine the family parents, who are at state of ‘celebration’ and didn’t know that they lost their child permanently. I also came to know that he is the sole son and bread earner of family, who recently got his job in ‘British Airways’, was 28 years old. There cannot be worst pain and trauma then this and how can you bridge such news? Mother is not told about his death as she won’t be able to accept. On the one side there is a lots of marriage hustle and bustle and moments of happiness, smiles etc. where as the other side complete absence of the person, who is the dream itself. The same family had faced one unfortunate death of uncle (living at same house) around 3 weeks ago and thus postponed this ‘engagement’ to at least 4 weeks. Why always Truck Drivers are Killers? They drink and drive and do a total insensitive, unlawful, non-stop rash driving at night. They are the ones who are given driving jobs without any effective parameters. They are illiterate and from other labor types, and at times have no driving experience, are given these giant killer trucks. The news is published in Total TV and local newspapers. 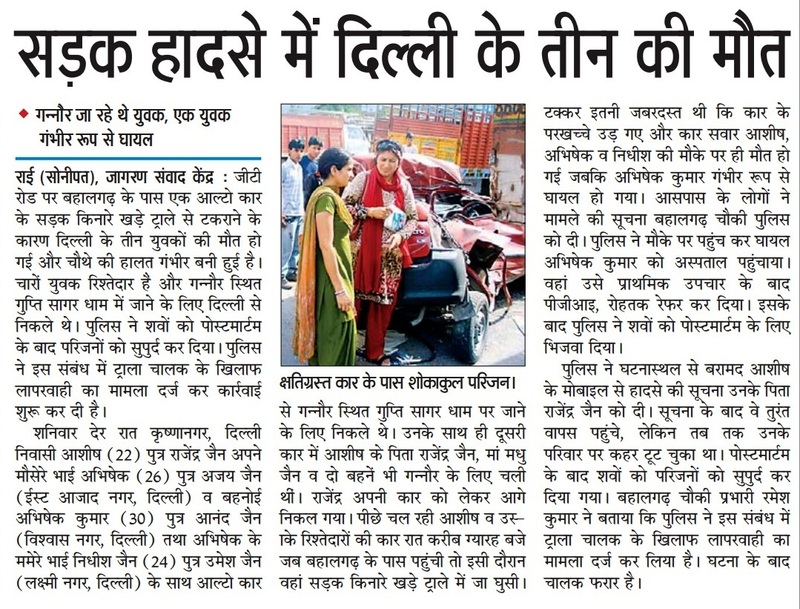 The following is a glimpse of ‘Hindi’ Newspaper in Delhi-NCR. How terribly sad. I know this happens in Greece a lot. Speed requires training, don’t they have driving licence requirements in India? Hard to find the balance between regulation and common sense. England, the other extreme on the scale, is becoming over-regulated. I think it’s because of a collective depression and lack of meaning. It makes people ill, addictive to stuff like alcohol, and therefore unreliable. I don’t concur on your comment about over-regulation in England. I do not think over-regulation is true in UK’s case as I have been living in UK for about 25 years. Passing driving licence exam must be indeed hardest to pass anywhere. I also know that it is much easier in US as compared to UK and in India the passing driving exam is just a formality and openly achieved with the bribe. The accident rates in UK is one of the lowest in EU in comparison to France, Germany, Italy, Spain, Poland, Romania the major countries. It (fatalities : 1905 in 2010)is however more than Greece’s 1258. But overall in whole of EU fatalities are going down since at least 2000. I bet it must be going up in India as more the vehicles enter there on road – mayhem increases even more without any new enforcement initiative.